Yesterday I went to a Baby Shower. 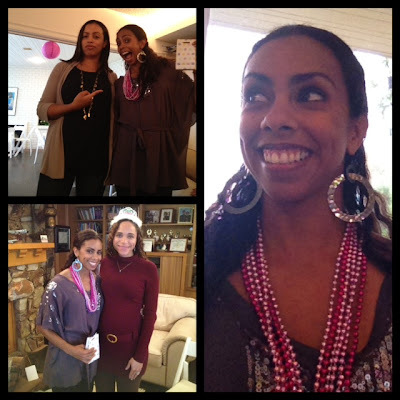 And yes, I'm typically the girl that enjoys baby showers as much as I do grocery shopping--a necessary evil that sometimes just has to be done whether you feel like it or not. But every once in a while--like when Trader Joes is handing out free samples and I run by and grab 3 and feel like I got a whole snack for free--I enjoy myself more than I thought I would. My friend Bianca's shower would fall in that category. It was gorgeous, the food was amazing, I had a great time hanging with my friends, and they actually got creative with the games and livened it up a bit. This totally made up for the amount of times I had to oohhh and ahhhh over a set of bibs or clap over a bag of diapers. Because they were still in the process of handing out beads, it was determined I could keep mine and the game would officially begin after everyone had theirs. Awesome. So about 5 minutes later I catch someone else saying the forbidden word and score my first pair of additional beads. And that right there, ladies and gentleman, is where the tide turned. This was now a competition and I had decided I wanted to win it. So, for the next 3 hours I carefully thought out every sentence before it came out of my mouth, eavesdropped on conversations I wasn't a part of, and plotted my way to victory. There was not one moment of that party where I wasn't aware of the competition I was involved in. Why? Because I like winning. Because I love competition. And because once I set my mind to something, there really isn't anything that can deter me. In case you are wondering, I won a Starbucks gift card. Icing on top of the cake. Training at the Olympic Training Center has numerous advantages that go far beyond the cool photo ops you see displayed in the previous post. We are provided with a team of people to help us be our best, all at no cost to us. If there was a cost to me, most of these benefits would probably be things I would have to do without, but that's why I train here and why I am extremely blessed to be able to do so. There is literally a team of people all working extremely hard to afford me the ability to do my best, by giving their best. Out of all of the people and resources I have available to me... from coaching, to strength training, to a medical staff, to a nutritionist, down to a driver when I need to go to the airport, by far the most valuable and useful to me over the last three years I have been here has been my Sports Psychologist. Hands Down. No questions asked. In fact, last year I wrote a post specifically about the invaluable help I had found in Dr. Ross Flowers in a post I aptly titled Head Help. Take a second to read it if you don't remember, but the gist of it was how I had come to learn that the mental side of training is so important, and I truly believe it makes all the difference in the world. It is a process though, not only realizing the value of working on this aspect of your preparation, but also the trust and confidence that develops in the relationship you build with your Sports Psychologist over time. For me, this was huge. In the three years I have been training at the OTC I've had the initial coach I moved down there to work with, to working with nobody at all, to this last year beginning work with a new coach that was a bit of a struggle for me. But through all those changes, I had the one constant in my support team that helped me manage any situation and continued to work towards helping me become the athlete I want to be. That constant was Dr. Ross. So, imagine my shock when last week we were told by the USOC that Dr. Ross would no longer be a part of our team at the Olympic Training Center, effective immediately. In his place, they were happy to give us the number to a guy that lives across the country that would be willing to talk with us. And that was it. I don't know the story behind all of this, and it's probably not my business to know. Like I said at the beginning, I don't pay the salary of the team that supports me. But what I do know is that at the beginning of training for the 2012 Olympic Season, I have lost what I believe to be an integral part of my support, and that saddens me tremendously. I have said this many times before, but it bears repeating here-- what matters most at this stage of competition is the strength you have between your ears. 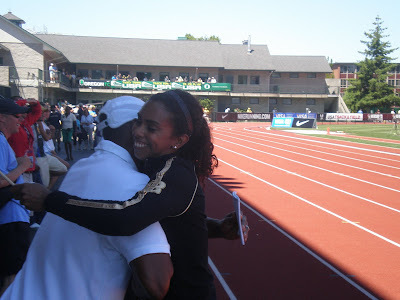 I learned that quite convincingly the year I jumped well and had NO coach, mostly because I had Ross helping me figuring out how to be the athlete I already am. Does everybody need this type of help? Maybe not, but I know that I do and I'm happy to admit it. So with all the work that I planned on doing this year technically improving myself, I knew that I would spend just as much energy continuing to improve on the part that I believe makes the most difference. I'll still have to do that, but without the help of my team. It's unfortunate. Imagine if every day you had a constant reminder of your biggest goal plastered on the wall in front of you. Imagine if you pulled up to work and saw image upon image of people who have aspired to accomplish what you do and have achieved it. Imagine if every time you were finding it hard to stay motivated for the task at hand, you could take a look around you and instantly be energized to continue working hard to the best of your ability. Imagine if the ultimate symbol of your dream was not something that you just thought of in your head, but was literally everywhere you looked. I don't have to imagine because this is my reality. 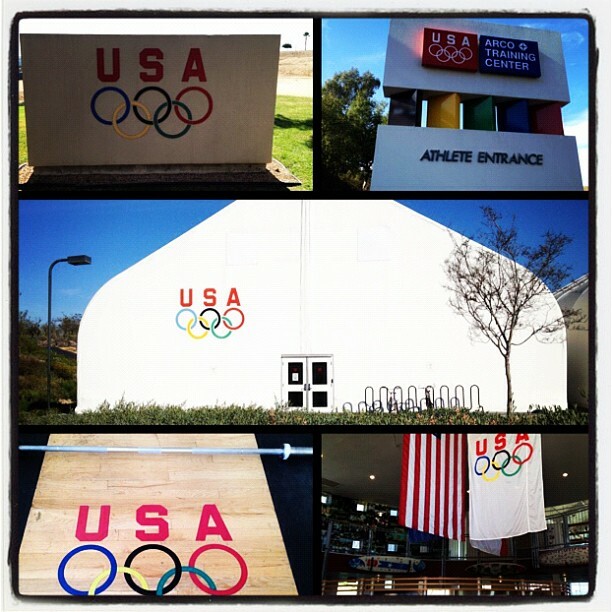 I train at the Olympic Training Center, and to be able to do so is a huge honor and blessing for a myriad of reasons. But perhaps something that can be easily overlooked, is just how inspiring it is to be in a place plastered with Olympic rings and american flags all around you. It's not that I don't wake up every day knowing why I'm here, what I'm doing this for, or how important my goal is to me, but having this constant affirmation is helpful. In fact, it's a gift. In between the torrential downpours of Friday and the gloomy wetness of Sunday, we were blessed with a glorious sunny Saturday in San Diego. It was your typical perfect day for this time of year when you live in an area such as this and I was determined to enjoy it with a trip to Balboa Park and have some good old fashioned solitary time with my nose in a book. This is my idea of the perfect afternoon. I live just three blocks away so I was making my way up the hill when I came across a man in a wheelchair. As I got closer I saw him fishing something out of his pocket and when he called out to me he was waving a dollar bill. "Excuse me miss, would you mind pushing me up the hill? I'll give you a dollar?" Mark was in a wheelchair because he had broken both of his legs and they were sticking out straight in front of him in two casts. From the looks of it, it also seemed as if he spent the majority of his time on the streets. I assured Mark that I didn't need the dollar because he was actually helping me out. I hadn't done a workout for the day, and some good resistance training seemed like a pretty awesome workout to me. It was a win, win. He laughed loudly at this, but continued to offer his dollar as a thank you. By the time we reached the top of the hill Mark began to talk. And talk. And talk some more. We covered everything from the precious time he spent with his Dad fishing, to his time in the war, to how he volunteers at the Veteran's Center talking with soldiers dealing with PTSD, to his buddy Jim, to his tattoos and what they all mean (as well as up close views once he wiggled his shirt off), to Fort Bragg, to his childhood, and everything in between. Sometimes he laughed loudly and other times he'd cry unexpectedly, but more than anything he just kept talking. Not all of it made sense but I don't necessarily blame that on Mark's inability to always form coherent thoughts, as much as I think it was him trying to get it all out. His stories. His life. Him. In the middle of the conversation he stopped and said, "you know what I like the most? You just standing here talking to me. Us just being able to talk. Nobody really does that." But before I could respond he was telling me another story. I am not the chit chat with strangers type. Anybody that knows me will tell you that. I hate small talk and I avoid awkward conversations as much as possible. But there I was an hour later still listening to the same stories be re-told because I realized it made someone else happy to be able to share his stories with me. When it was time for me to finally get going I asked if there was anything he would like me to remember to pray about for him and all he said was, "No, I'm ok. Just pray for the soldiers coming home." This has nothing to do with anything except that sometimes the encounters that don't seem like anything seem to leave the biggest impression and teach you the most valuable lessons. Of course I prayed for Mark, but I also prayed that I could learn to be more like him in a lot of ways.